Drain Cleaning/Rooter Service - Same Day drains offers a wide variety of plumbing services throughout Central North Carolina, including drain and sewer cleaning services, drain repair, and more. 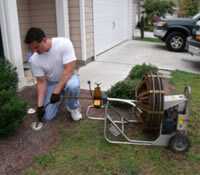 The most common method for drain cleaning involves inserting a snake cable in the line. Using a spinning motion, the cable loosens debris and clears the line. Kitchen sinks, bathroom sinks garbage disposals, bathtubs, laundry, and sewer lines are normally cleared in this manner. However for extensive clogging or damaged pipes, we sometimes have to replace bends or lengths of pipe. For difficult clogs and stoppages, Same Day Drains even provides Video Pip Inspection technology, allowing visual inspection of what may be causing the drain blockage. Regardless of your individual needs, Same Day Drains will fix all your plumbing and draining issues. Contact Same Day Drains plumbing specialists serving Apex, NC and other surrounding cities to schedule your plumbing appointment today.